Secretary of State John Kerry’s Middle East peace plan appeared to unravel late last week after Palestinian leader Mahmoud Abbas rejected "most" of the key details, according to regional experts and media reports. Kerry landed in Israel on Thursday for another round of talks between Palestinian and Israeli leaders as he pushes them to accept the parameters of a U.S.-backed security plan and interim agreement. However, Palestinian President Mahmoud Abbas reportedly rejected many key elements of the deal, claiming that it was too kind to Israel. "This looks like a plan drafted by Israel," Abbas reportedly told Jordanian King Abdullah II, according to Israel Hayom. "Before meeting with Kerry, Abbas told Jordanian King Abdullah II that he intends to reject most of the points suggested in the American proposal," a senior Palestinian official was quoted as telling the Israeli paper. While U.S. officials hope to have the framework for final status agreement between the two sides by April, Abbas’ refusal to bargain could delay the process. U.S. intermediaries appear to be taking their time in a bid to push the players into accepting a framework agreement that would set the table for future final status talks. "It’s not like there is a plan and they have to say, ‘Yes' or ‘No,'" said one U.S. source familiar with the negotiations. "It’s an ongoing and intense discussion between the parties and the Americans on how to address security issues in a two state solution." Despite media reports claiming that talks have stalled, both sides continue to quietly meet. "The negotiators are meeting regularly and the meetings are serious and ongoing," said the source. Kerry made a similar point on Sunday when he declined to discuss exact details of the talks during an interview with ABC’s "This Week." "I think it's much better for us to do exactly what we've been doing, which is negotiate quietly and privately," Kerry was quoted as saying. "We've agreed not to be talking about what we're doing because it just creates great expectations," he said. "It creates pressure. It creates opposition, in some cases." Abbas is reportedly prepared to re-launch an anti-Israel campaign at the United Nations and elsewhere if Israel reneges on a deal to release another set of imprisoned Palestinian terrorists. 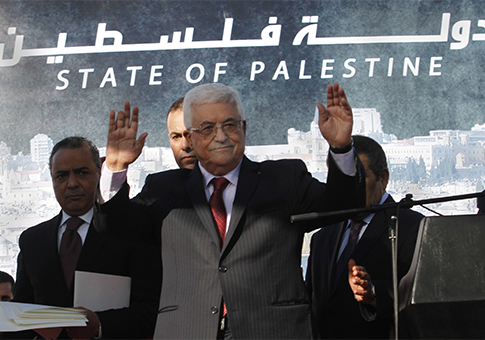 Abbas also hinted that he is not on board with the U.S. timeline for talks. "We may decide to extend the current round of talks by one month, beyond the nine months originally allotted, but we will not agree to anything more than that," Abbas was quoted as telling reporters late last week. "All talk about an Israeli presence in the Jordan Valley is nonsense, because so long as there is an occupation army presence on Palestinian lands there will be no solution, and all settlements must be cleared off of Palestinian territory." The Palestinian side "will never accept a partial or interim deal," Abbas said, appearing to throw a wrench into U.S. plans to push an interim framework and security deal. Middle East expert Jonathan Schanzer said the United States appears to be pushing its goals further back in response to Palestinian opposition. The idea of an interim framework "to me looks like the administration is moving the goal posts and that could be what Abbas is responding to," Schanzer said. "It sounds to me like the admin is beginning to understand some of its potential limitations," said Schanzer, vice president for research at the Foundation for Defense of Democracies (FDD). "It could be now hedging and talking about a framework as opposed to a deal that gets done by April. That does appear to be a hedge." Responding to reports that talks have reached a stalemate, the source familiar with the talks said, "That’s not the case. The talks are ongoing." The media rhetoric is an attempt to pander to the more hardline elements in Israeli and Palestinian society, the source insisted. "Both leaders are facing intense political pressure on both sides," the source said. "Both leaders have domestic constituencies they have to deal with. There will of course be obstacles, but the parties are committed to the talks." This entry was posted in National Security and tagged Israel, John Kerry, Mahmoud Abbas. Bookmark the permalink.